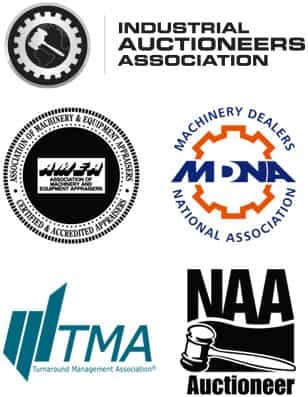 Welcome to Quaker City Auctioneers, Inc.
QCA is a 3rd generation full-service industrial and commercial auction, liquidation and appraisal company with over 86 years of experience in buying, selling, auctioning, appraising and liquidating all types of machinery, equipment, and real estate. QCA conducts state-of-the-art on site, live, webcast, theatre-style, or timed online auctions. Your specific circumstances or situation will dictate the manner of liquidation to maximize the value of your assets. Our certified appraisers will value your assets in any location. Call us today at 215-426-5300 for a confidential consultation. MAY 4th (Saturday) – PJR FARMS LLC (Bankruptcy No. 18-32674-CMG)– LIVE & ONLINE (Hightstown, NJ) — Tractors, Field & General Farm and Irrigation Equipment, Trailers, Over-the-Road Trucks and much more! CLICK ON THE AUCTION NAME IN THE UPCOMING AUCTIONS BOX TO THE RIGHT FOR MORE DETAILS once listings are provided. FOR PAST AUCTIONS, CLICK ON THE AUCTION CALENDAR BOX TO THE RIGHT. …more Spring auctions to follow.